Juxtaposing Henry Fielding’s Tom Jones (1749) with the civic and economic discourses of Adam Smith—The Theory of Moral Sentiments (1759) and The Wealth of Nations (1776)—this chapter investigates the origins of homo economicus in the novel, moral philosophy, and political economy. 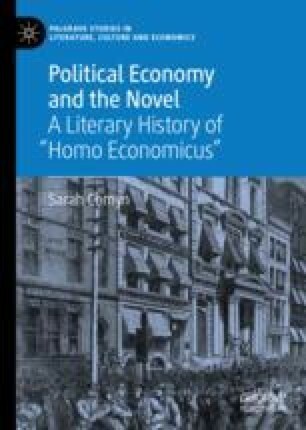 Analysing the growing tensions between propertied wealth and that of cash and credit, Comyn demonstrates that the original homo economicus is not simply a rational, self-interested individual. Rather, as Comyn shows, Adam Smith’s vision of the economic individual recognises the need for imaginative empathy in mediating the relations of people but also in judging the value of commodities. Comyn reveals how Smith refigures many of the concerns raised by Tom Jones regarding the nature of fiction, writing, and value, and the problem of representation attendant to both writing and the emergent paper currency.